From scientific sound collection to entomological erotica. Part 1. The BioAcoustica project goes from strength to strength. Recently Klaus-Gerhard Heller and I published a new species of the bush-cricket Horatosphaga that Klaus-Gerhard first identified from a recording I had made available on the platform. 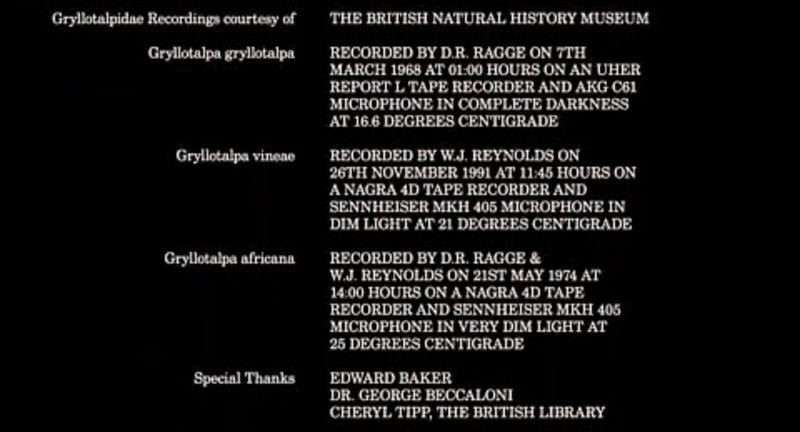 The species was named in honour of David Ragge, who worked on bush-crickets at the Natural History Museum (NHM) in London for many years, as well being the founder of the NHM's library of recorded wildlife sounds. Making the NHM sound collection freely available allowed Klaus-Gerhard to identify the potential new species - and after I re-prepared the future holotype to expose the stridulatory file it could be confirmed easily enough. The openness led to a new collaboration. The first taxonomic group that we have made data available for was the Gryllotalpidae - in part because of the status of Gryllotalpa gryllotalpa in the UK is of interest, and in part because the NHM also has casts of some of the acoustic burrows made by males. "The Duke of Burgundy is the most tender love story you'll see in which a woman forcefully urinates in her lover's mouth." This obviously needs to be checked out. The only issue was I had completely forgotten about supplying the recordings. I initially assumed they were just taken from BioAcoustica - but the film was made just before BioAcoustica went live. "We'd be using as part of a film soundtrack - it's the story of two entomologists ( sort of!) - in one scene they listen to Mole Crickets...."
So that's how George and I ended up being credited in The Duke of Burgundy.